Chip Peterson is a character in the HD Universe appearing as a minor character in Grand Theft Auto V. He is voiced by Will Cart. Chip Peterson is an architect, presumably with an extensive and well publicised history within his profession, who designed the FIB Building (and presumably the IAA Building as well due to its similar design and the common plaza between the two buildings) in Los Santos. He is allowed by the FIB to keep a blueprint of the building's plans. In 2013, Michael De Santa, Franklin Clinton and Lester Crest begin plotting to break into the building to perform a terrorist attack and retrieve incriminating information about and on orders from corrupt FIB agent Steve Haines. In preparation for the attack, Franklin is sent to acquire Peterson's blueprints. Franklin locates Peterson at the high rise construction site where he mocks the construction workers for being unable to vision. 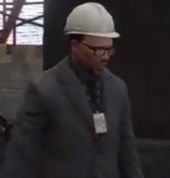 Franklin follows him on to the construction site and steals the blueprints with the player being able to kill or knock out Peterson. This page was last modified on 23 March 2015, at 14:36.